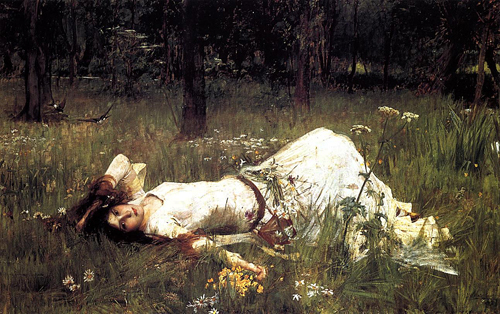 “Miss Siddal had a trying experience whilst acting as a model for Ophelia. In order that the artist might get the proper set of the garments in water and the right atmosphere and aqueous effects, she had to lie in a large bath filled with water, which was kept at an even temperature by lamps placed beneath. One day, just as the picture was nearly finished, the lamps went out unnoticed by the artist, who was so intensely absorbed in his work that he thought of nothing else, and the poor lady was kept floating in the cold water till she was quite benumbed. She herself never complained of this, but the result was that she contracted a severe cold, and her father wrote to Millais, threatening with an action of 50 lbs. for his carelessness. Eventually the matter was satisfactorily compromised. Millais paid the doctor’s bill, and Miss Siddal, quickly recovering, was none the worse for her cold bath.” — The son of the artist, John Guille Millais , describing the incident. 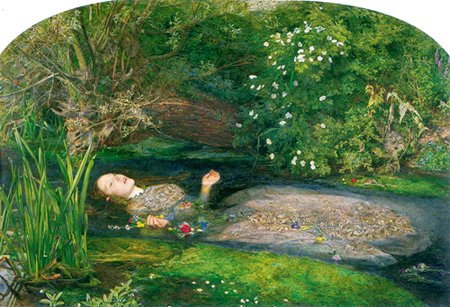 (For more on the painting by Millais, see the Ophelia page on my site LizzieSiddal.com. 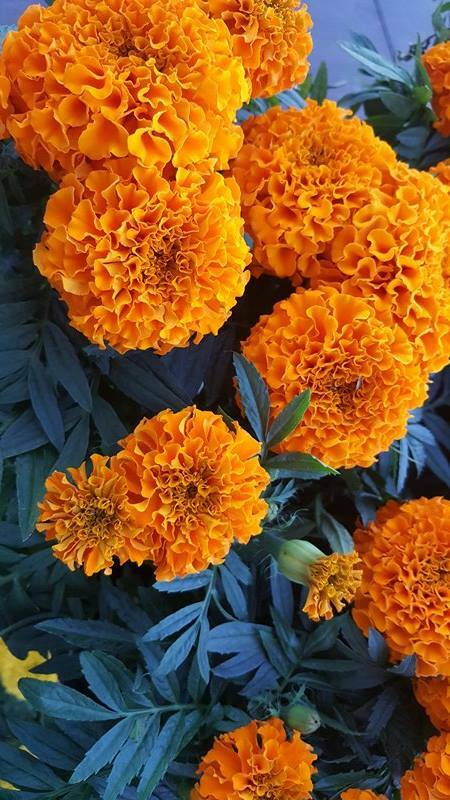 On this site, see Ophelia’s Flowers. 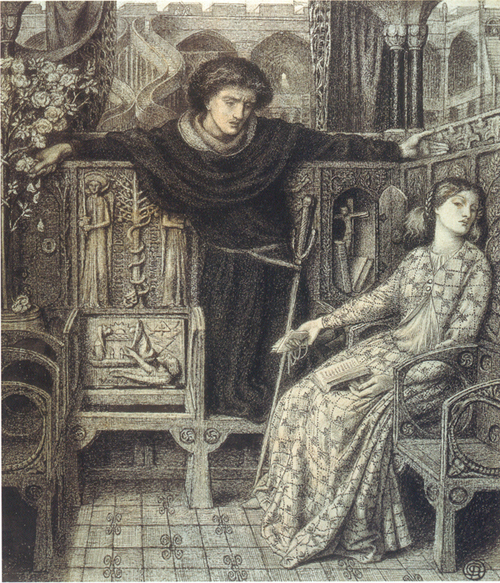 HAMLET: I did love thee once. HAMLET: You should not have believed me; for virtue cannot so inoculate our old shock but we shall relish of it: I loved you not. 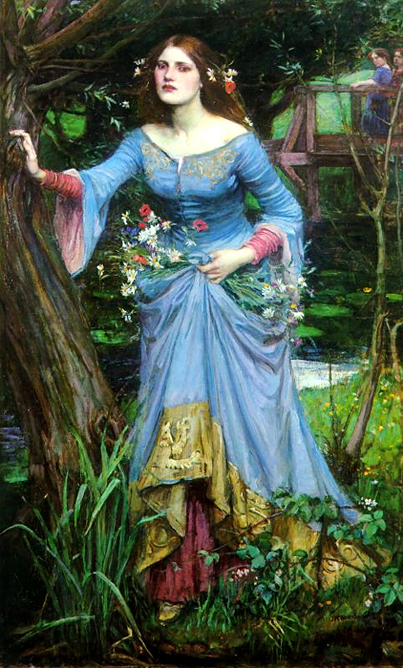 Arthur Hughes painted this version of Ophelia in 1852. 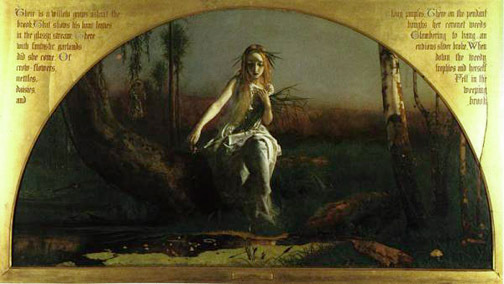 (see painting below) Hughes shows Ophelia beside the stream that will eventually take her life. The water seems stagnant with a slimy film on top. I don’t think you can see it in your monitor, but on the right hand side of the painting (just under the tree trunk) there is a bat flying close to the surface of the water. Laertes. Alas, then, is she drown’d? And therefore I forbid my tears. I agree that these are lovely lines… a hint of a sonnet Shakespeare never wrote perhaps. I used that idea to write a sonnet for my ex and she loved it. Hi Stephanie, Phil put me on to your page. 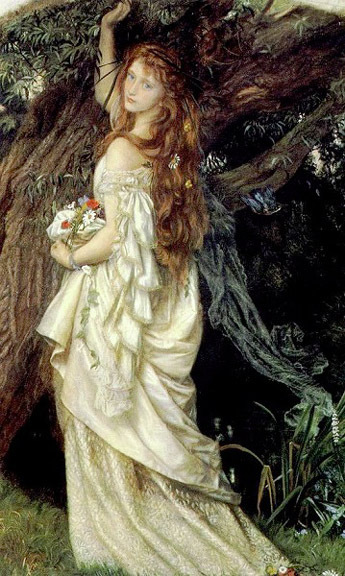 I have a query, the Arthur Hughes version of Ophelia; who was the model he used, I cannot find it anywhere. Could it have been Elisabeth Siddel as well. They certainly look similar. 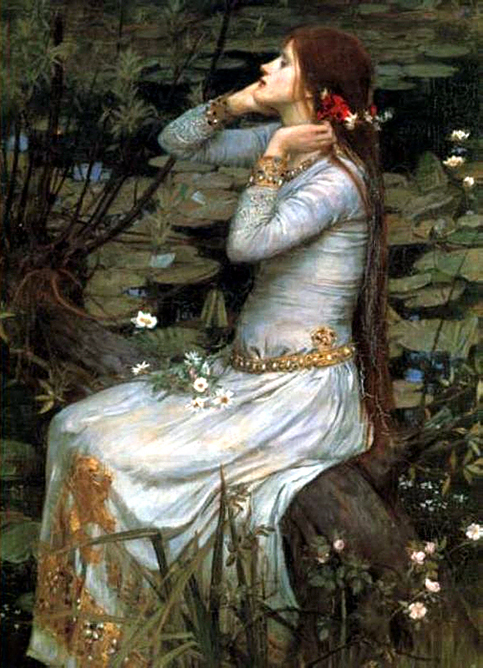 They list Hughes wife for his later works but make no mention of the Ophelia painting. Any info you could provide would be appreciated. John Berry.